Fall Conference this year was a challenge. Each year, religious educators gather to learn together, to renew our spirits together, at our annual Liberal Religious Educator’s Associate (LREDA) fall conference. This year, in Denver, the conference went terribly wrong. Speakers for the conference are often contracted a year or more in advance. This year, our guests hoped to speak to us about Non-Violent Communication (NVC) and how it relates to our Unitarian Universalist Principles. NVC techniques can be powerful experiences for people who are trying to break through communication barriers. And yet because it forces emotional intimacy, particularly during situations of unequal power, marginalized people such as people of color or indigenous people (POCI) may experience NVC as violent. Some of our LREDA members expressed concern about the topic this year, the speakers reassured the conference planners that all would be well, and no, they wouldn’t add a POCI speaker to their midst. We watched the conference completely fall apart this year. The first evening started with a speaker expressing nervousness, because “it’s a tough time to be a white male right now.” The evening ended with an activity that included forced intimacy without an explanation of pedagogy or what would happen during the activity. By evening’s end, most POCI had left the room. The next morning, despite attempts to help the speakers get back on track and stay relevant to current needs, the presentation remained tone-deaf. At a point, the speakers compared a 16-year-old who didn’t receive a new car for their birthday to a foster child who had recently lost their parents. When they tried to explain that both children would communicate on equal footing with equal needs, the room erupted into protest. The speakers were shut down, and our body of religious educators was asked to remain and wait patiently while adjustments were made to programming. What resulted has left me in awe and with great hope that with enough care and attention, we truly can heal the world. After meetings between the LREDA Board and the Diversity and Integrity Team, (and an invitation to POCI to join in conversation with the board), revised programming began. We started with a White Supremacy Teach-In by Jessica York, Co-director of Ministries and Faith Development at the UUA, and Annie Scott, LREDA President. Jessica spoke powerfully to the impact of white supremacy culture, and Annie modeled listening with curiosity and humility. Over the weekend, through the hard work of many LREDA professionals, we held powerful Restorative Justice circles, we caucused by race to deepen our understanding, we listened, we learned, we committed to hold ourselves accountable to learning new ways of doing our work that are just and relational for everyone. What was most powerful for me was to see a large organization that had invested hundreds of hours in a mammoth project call a halt, and respond quickly to begin relational work. They moved forward with open hearts and a willingness to change, seeking to foster inclusivity and multiculturalism. Watching and participating in the process through the remainder of the week left me hopeful and heart-full. 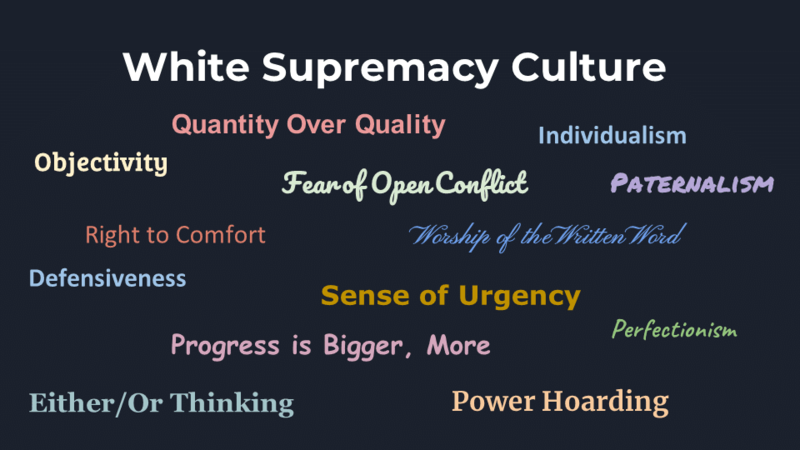 I have recommitted myself to paying attention to and dismantling the culture of white supremacy, to the ways in which we operate that are unwelcoming to people of other cultures. I am committed to centering voices from the margin. Will you join me? Read more about white supremacy culture here. This story was very interesting to me. While I agree, judging by what I read here, that the conference leaders made some VERY unfortunate choices, I do not believe that they were following NVC when they made any of those choices. It is ironic that the people who left the conference were practicing NVC better than the leaders of the conference.